By James Slater: Houston’s very own heavyweight hope Skipp “Strictly Business” Scott is set for his next fight on January 10th. The 6’8” giant, last seen scoring a 1st-round KO back in May to improve his record to an impressive 15-1(10) will face the experienced Kertson Manswell of Trinidad and Tobago, and Skipp says he wants to “make a statement” in the Lou Savarese-promoted bout that will kick off 2013. James Slater: You will be back in action in January, correct, Skipp? Skipp Scott: That’s correct, yes. J.S: And do you know who you will be fighting, and where? S.S: I’ll be fighting Kertson Manswell, and it will be a ten-round fight; my first ten-round fight. It will be right here in Houston on January 10th. Lou Savarese will be doing the promotion. J.S: You last fought in May of this year as you know, a 1st-round win. Have you been in the gym since that fight? S.S: Oh yes, I’m constantly in the gym. This is a lifestyle not a hobby. I love boxing. I’m in the gym with [trainer] Bobby [Benton] perfecting my craft. We’ve been working on my skills, my movement and my style. I don’t just want to rely on my power. This being my first ten-rounder, I’ve been doing a lot of cardio work. J.S: What do you know about Manswell (23-6-17KOs)? S.S: I know that he’s usually a pretty durable guy, although Deontay Wilder took him out in a round. But Deontay is an excellent puncher. I’m also an excellent puncher! I’ll be smart about the fight, and I definitely won’t look past him, but if the KO comes I’ll take it. I want KO’s. I don’t want to be a heavyweight with a lot of decisions on my record. J.S: What weight do you plan to come in at for this fight? S.S: I plan to be at 250-252-pounds. That’s my weight, where I feel strong at. As I say, I’ve been doing a lot of cardio and it’s actually kind of hard keeping the weight on. J.S: What is you ideal timeframe as far as number of fights for 2013? S.S: With me going back out in January, I’d really like to get four or five fights next year. I’m looking at [Bryant] Jennings and what he did, having five fights this year, and I’d like to do the same next year, and make my splash. I want to be busy. As long as I can control fights with my jab, and avoid picking up any injuries, I can keep getting the fights and keep on getting the KO wins. J.S: As you know, the heavyweight division has been interesting this year, especially with the young guys. 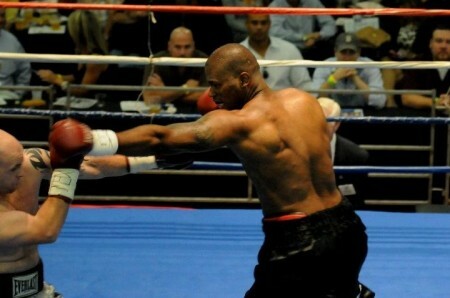 Seth Mitchell got beaten in an upset by Johnathon Banks, and in the U.K Tyson Fury and David Price really came through. Are those the type of guys you will be looking at facing in, say, ten months from now? S.S: Oh yeah. Those guys, Banks, Fury and Price, they’re all excellent fighters. I spoke with my manager [Kerry Daigle] about going overseas to Europe to fight those guys. I love their style, they’re big heavyweights and as I continue to climb the rankings, I’d love a fight with them in the next 12 months. J.S: It is a good time for talented young U.S heavyweights. Aside from yourself, and you mentioned Jennings, who is out there that you’re looking at? S.S: There’s Jennings, Deontay [Wilder], and then, although there’s not been as much noise about them, guys like Malik Scott, who is an excellent boxer. And even in the Houston area, there’s Justin Jones, Eugene Hill and some others – guys who have not had that T.V coverage yet, but whose time will come. Our recognition will come. Hopefully we can make the division the way it was back in the 1990s, when Holyfield, Lewis and Tyson were around. J.S: They were great times indeed, Skipp! The last time we talked, you spoke of your desire to get Aaron Lyons back in the ring. Is that still the plan, to avenge your first pro loss? S.S: That’s still on my radar, yes. It would have been this fight, but we were offered a ten-rounder instead, so of course we jumped all over that. I can see me and Lyons fighting in the next two or three fights. We were both making our debut when we fought (in Feb. of 2006) and we’ve both come on a whole lot since then. He’s picked up a few losses, but he’s gone to the other guy’s hometown and I think he actually deserved the win a few times but it went against him. Myself, I’ve come on 90-percent, 95-percent since that loss. J.S: It’s been great speaking with you, Skipp. Finally, you have a prediction for Jan. 10th? S.S: Just so long as I get the win. I will go for the KO, as I said, I don’t want to be a heavyweight with a lot of decisions on my record. That’s what heavyweights are supposed to do: score KO’s. I want to make a statement and show that Skipp Strictly Business Scott is just that, all business!